Lewis Hamilton drove a skilful, aggressive and well-judged raceÂ at the Turkish Grand Prix to answer the critics who wondered whether the wunderkind who thrilled us for of much of the 2007 F1 season would ever return. Hamilton would have been Driversâ€™ world champion last year but for an end of season loss of form which, although perfectly understandable given his youth, nevertheless disappointed his fanatical fans. In the winter he relocated to tax haven Switzerland to take advantage of his hugely enhanced earning potential, and a few commentators wondered whether he had fallen a victim of celebrity and fame. But his drive in Istanbul will have answered all the critics. It was a mature, disciplined and error-free drive in a car which was clearly a crucial few split seconds slower than the Ferraris. 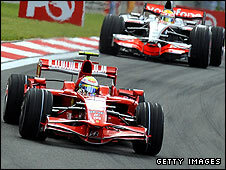 McLarenâ€™s tactics in going forÂ a three-stop race compared with the two Ferrariâ€™s two-stopper relied on Hamilton to deliver â€“ driving fast when his fuel load was lighter and catching up well when the Ferrariâ€™s used their greater speed to apply the pressure. Kimi Raikkonen helped McLaren by starting poorly, but he focused hard later in the race and would have pounced had Hamilton faltered. The delightful Felipe Massa deserved his third successive Turkish Grand Prix victory â€“ what an excellent driver he is on his day. But the F1 world will be delighted that Hamilton has shown that his 2007 successes were not a flash in the pan and that he remains as committed a racer as ever â€“ despite the fame and the fortune. No user commented in " Lewis Hamilton hits form "